Odoo ERP Installation | Synconics Technologies Pvt. Ltd. Cloud or On-premise by friendly experts. Adopting right deployment strategies our success has been proven with hundreds of Odoo ERP installations and implementations throughout the world. We are exclusively focused on implementing the best ERP solutions to the mid-market. Embarking on installation best practice our team will analyze the whole scope of IT infrastructure, budget, user logins and any other untold or unfold factor with a view to set the best suitable Odoo ERP system at your end. Understanding the business process we assist in the selection of Odoo ERP version and editions (Online, Enterprise, Community) along with hosting options like SaaS (Odoo online), Dedicated or Public Cloud or on premises. We also assist how users will connect to the ERP – via VPN or over a public IP address. We can bind IP address with domain/sub-domain as well. As the system is browser based we advise for minimal hardware but with a high speed. If required we can also install Https and SSL certificates which provide secure, encrypted communications between a website and an internet browser. Do you need Odoo ERP Installation? Turn to Synconics for expert advice and to have the right Odoo ERP installed and set up in your on premise Server or On Cloud Dedicated Server. We are active in Odoo ERP system from many years and adequate to handle the complex installation procedure being onsite or offsite in Local server, Remote dedicated server and SaaS base server as per preference. According to request in any version and any edition either its Enterprise or Community, we are competent to install at recipient. We mainly prefer Ubuntu operating system and prior to installation, we recommend client for the hardware requirement by considering user environment. Our team will analyze the whole process thoroughly to understand the scope of IT infrastructure, budget, user log in and any other untold or unfold factor with a view to set the best suitable Odoo ERP system at your end. Our duty starts from forecasting hardware requirement and system designing part and deadline solely defined is Go-live including drilling employee. We assist you to choose; the kind of installation will suit you and search both, the dedicated server service provider and package; which comprise the company's benefit. Either we will take charge of dedicated server hosting on behalf of company with proper time to time backup responsibility. Selection of any version of Odoo ERP either its Enterprise or Community, with hosting proposal like SaaS or on premises, whatever preferably convenient or recommended for the organization. As a beginner, we understand your basic requirement is to deliver an ERP system as per your terms instead of diversifying your process which fit its constraint. We believe that the solution should be stalemate workable using which we can alter your future needs. In short you need a solution that makes sense your organization and provide you utmost flexibility which will accommodate your future needs. The below stated information will enable you to opt for the best suitable model of formation as per your business needs. The immense capability of ODOO ERP system is, that it’s available to deploy on your own private network or on Cloud and can be easily used in web browser to do the job. 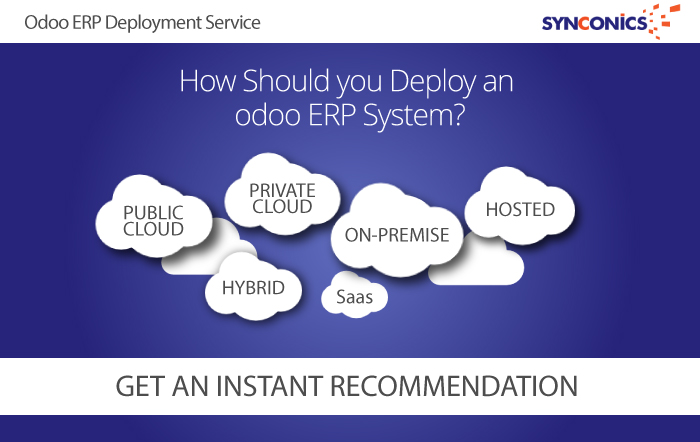 Synconics will assist you to install your Odoo ERP on premise with remote or onsite installation. With auto Odoo ERP start facility as Operating System boot, no need to start Odoo ERP as your server reboot. Also we provide service to bind your Odoo ERP server with fully domain name and SSL certificate. With an on-premises ERP deployment, the server infrastructure and software are owned by the company, reside within the organizational boundaries or firewall, and are handled by a dedicated internal IT team. This allows the company to maintain full control over the data and applications. Moreover, the system availability, up-time, security and disaster recovery objectives are at the customer’s control. Synconics provide you per user Odoo ERP ready package install hosting service. A private cloud adopts the virtualized, self-service model of the public cloud; however, it typically does so within the company’s firewall and is collocated at the Synconics datacenter. The company either owns the ERP software and infrastructure or Synconics provide an option for leasing this as a service. An important distinction from the private cloud model is that the service is provisioned exclusively for an organization (i.e., single tenancy) without any sharing of infrastructure among multiple customers. Off-premises can include either a cloud-based or a partner hosted deployment of the ERP solution. Our team will deploy the system at your convenient premises hired by you. Cloud has quickly evolved into an IT industry buzzword, but companies need to recognize that there are significant differences in what each vendor offers as a cloud service. The Odoo ERP solution takes a web-hosting model in which the data and application resides in a remote server and can be accessed via an Internet browser. Odoo Public cloud offers a shared or multi-tenant infrastructure that may be virtualized and is owned by the Odoo. The customer typically rents the Odoo ERP software and infrastructure and is charged on a pay-per-use or pay-per-user basis. We are exclusively focused on implementing the best ERP solutions to the mid-market. Our success has been proven with hundreds of Odoo ERP installations and implementations throughout the world. Our staff is all about excellence and customer satisfaction. We can handle all your needs, from implementation, customization and ongoing support. With our team working for you, you will get access to not only the best ERP solutions on the market but the best onsite and offsite support and training.